Opening hours: Most shops are open 10.00–19.00, Mon-Fri and 10.00–17.00 on Sat. Banks are open 09.30–17.30 Mon-Fri.
With its grand boulevards and big squares, Minsk is all about monumental excess, but its Old Town is tiny and not particularly old at all - most of the city had been rebuilt following the demolition in WWII. The best place to start exploring Minsk is at the Independence Square with its statue of Lenin and the Belorussian University building. Some of the best views over the city unfold from atop the futuristic structure of Belarus' National Library. The Old Town sits on the eastern side of the Svislach River, bordered by Vul Maxima Bahdanovicha. Known as Troitskoe Predmestiye, or “Trinity Suburb”, the Old Town is not really that old. The original 17th and 18th century houses were recreated in the 1980’s. However, it’s a delightful place to walk around in. You can relax in quaint cafés or browse through the souvenir shops. Down from the Old Town by the riverbanks is the evocative Ostrov Slyoz, or “Island of Tears”. 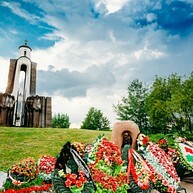 This is a memorial to Belarusians who lost their lives in battle, but particularly in remembrance of those that died in the Soviet Union’s war in Afghanistan in the 1980’s. Standing defiantly on a small hill is the Holy Spirit Cathedral, one of the most instantly recognisable landmarks of Minsk. This two-towered Orthodox cathedral is situated in the Upper Town. It was once part of a Polish Bernadine convent. The monastery buildings nearby are now a music academy. 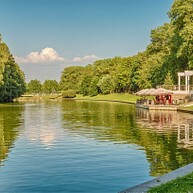 Gorky Park is the city’s oldest park, at its loveliest in the summer. 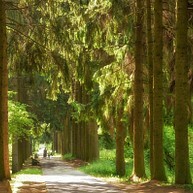 It is very popular with locals who often stroll along the well-tended paths. Gorky Park is a big draw to guests of all ages because of its enormous Ferris Wheel. Another reason to come here is the great view of the city. Better known as the “Red Church”, the Church of St. Simon and Helena was built in 1910 by a Polish noble to commemorate the death of his two children – the tower’s three bells are named after him and the dead children. At the junction of Nezavisimosti and Zakharava is this huge square, with a giant victory obelisk emerging from the centre. The monument has an eternal flame at its feet, which has been burning since 1954, and is accessible from an underground passageway. 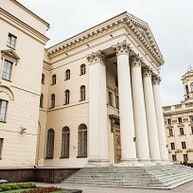 Next to the classical-style Trade Union’s Culture Palace lies the Museum of the Great Patriotic War. This museum tells of Belarus during World War II. It also tells the story of Minsk’s Jewish population following the Nazi invasion of the Soviet Union in 1941. Behind the building is a park filled with vintage tanks and planes. Across the road from the Museum of the Great Patriotic War lies a delightful little park that stands on the site of a 19th century marketplace. You often see people playing music here. North-west of Independence Square is a yellow neo-classical block, which houses the KGB building. On the other side of the street is a park, where you can find a bust of Felix Dzerzhinsky, founder of "Cheka" (the pre-KGB establishment of the Soviet Union). The Palats Mastatsva is a stylish and trendy hangout – well compared to the dour museums that tend to make up Minsk’s cultural scene. Palats Mastatsva is an arts institute where you will find galleries and book stalls. This is one of the most beautiful places in Minsk. The Botanical Garden is a leading scientific institution and home to more than 1,000 different plants. It is a tranquil place with a beautiful lake and the perfect spot to have a picnic at on a sunny day. National Library of Belarus is one of the most iconic buildings in the city, and it is easy to see why. Other than a vast selection of world literature, there is also an art gallery, cafe and an observation deck with a beautiful view over the city. 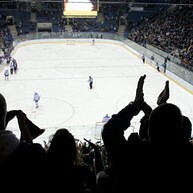 Minsk Arena is a great place to visit for concerts or fun-filled hockey games. 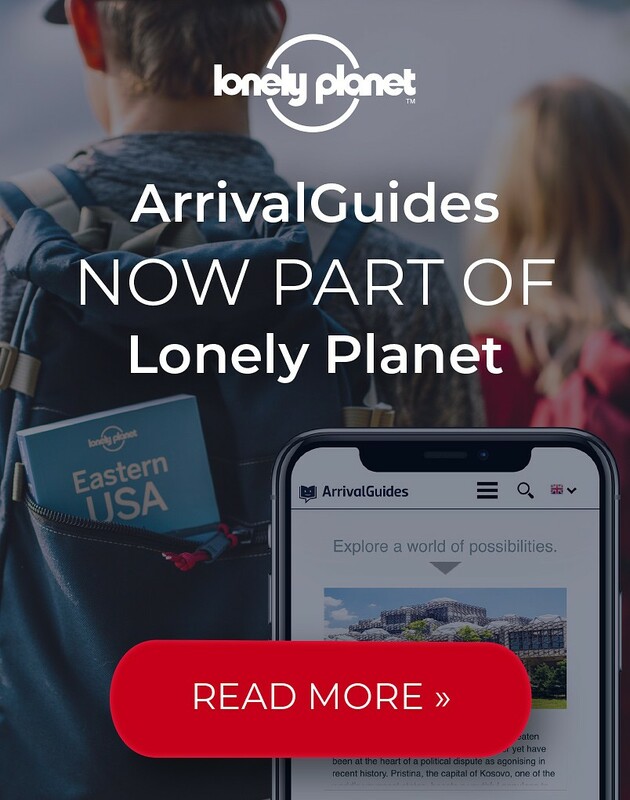 Check out their website while you are there to see what is on. You will also find 7 cafes and 3 different restaurants in the building. 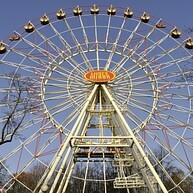 Dreamland Park is one of the main amusement parks in Minsk. 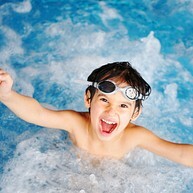 It is a park for all ages but children will probably find some things more exciting. There are lush walking paths, a zoological area with exotic birds and live entertainment. Few outings in the Belorussian capital can be as entertaining and amusing as going to the circus. Various performances are put on at the Belorussian State Circus - you should certainly try to catch one.